What is the International Yoga Festival? Parmarth Niketan is a top yoga center in our book “Yoga in India: a Journey to the Top 24 Yoga Places” and co-hosts the annual International Yoga Festival. This one-week festival located in Rishikesh, otherwise known as the birthplace of yoga, offers over 70 hours of yoga classes, satsangs and lectures from some of the most distinguished yoga masters and spiritual leaders of the East and the West. All levels of knowledge and practice are welcome. Why go to the International Yoga Festival? If you want to study yoga in India but only have a short amount of time, the International Yoga Festival is a great way to go. You will study with internationally renowned yogis and yoginis in one of the most beautiful and historical places in India. Rishikesh rests on the banks of the Ganges, India’s holiest river, in the foothills of the Himalayas. It’s unsurprising therefore that this spectacular city has remained one of the most important Hindu pilgrimage sites for hundreds of years. Where to stay in Rishikesh? 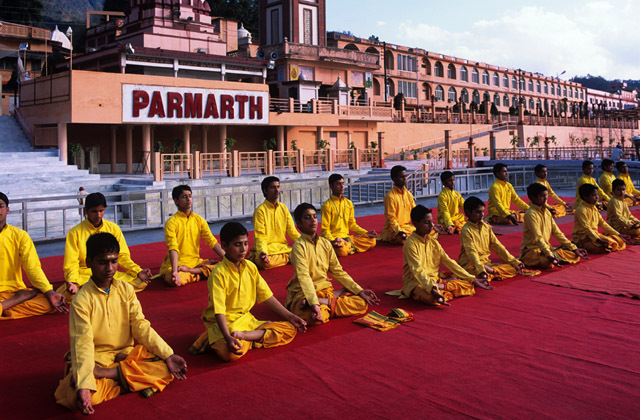 Most people attending the festival stay at Parmarth Niketan. Not only do they host the activities for the yoga festival, but they also perform the nightly riverside Aarti Ceremony, an experience you don’t want to miss. 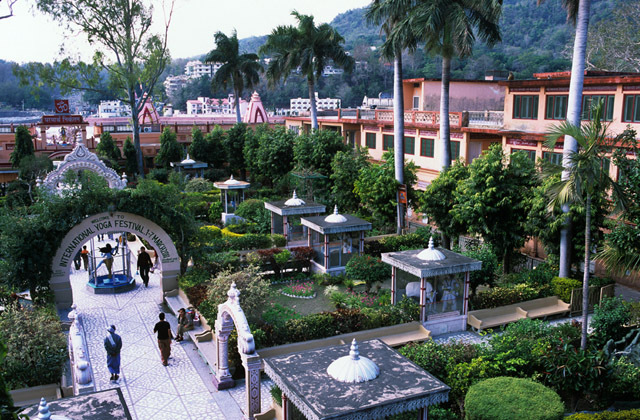 If there is no availability at Parmarth Niketan or if you prefer to get away from the crowd, there is no shortage of ashrams and yoga centres in Rishikesh and you are guaranteed to find one that suits your needs. 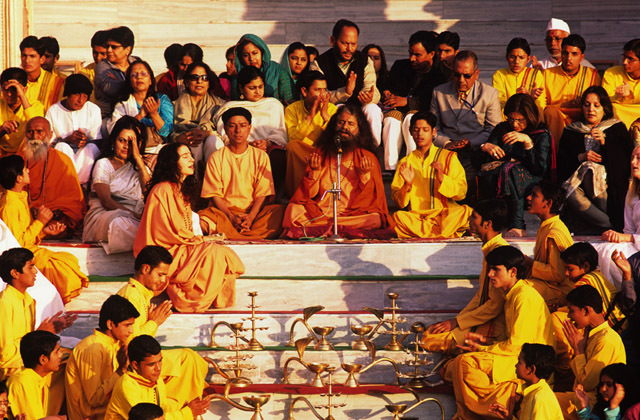 The sense of culture and community you experience in an ashram is one of the greatest gifts of India. 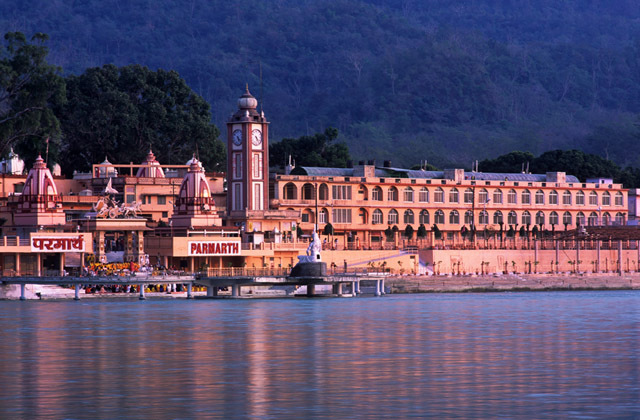 For those who are not yet comfortable with “beauty in simplicity,” you can also find some high-end hotels with amazing views of the Ganges and within walking distance to Parmarth Niketan. How to register for the International Yoga Festival? Registration is open online until February 26th. After February 26th you must register in person at Parmarth Niketan. You can register as an individual or as a group. Groups of 20 or more are eligible for a discount. You can find more information on the official website of the International Yoga Festival. All would be good with this festival, if it was not so expensive. Except for American guests, you will find most of other masters on the festival teaching in Rishikesh for free or for ridiculously small amount of money. The festival is definitely for newbies in Rishikesh. Thanks for your input on the festival and interest in yoga.in!